It’s back for its third instalment. Live Music, Street Food, DJs, Art and Exclusive New Beers! Friday we welcome back Travellers Kitchen, bringing globally inspired kebabs to our doorstep. For those who haven’t enjoyed their food before they’re a right treat! Saturday - The Grind return. After going down a storm at the last CraftWorks we’re glad to have them back. They do the best burgers in town! Pouring on Friday is our Haribo Tangfastics infused pale ale for the child in you. We think it’s a good way to secretly enjoy sweets, by hiding them in a beer, should make for interesting drinking. Also we’ll be showing off our new collaboration with Bierrex, a hefty 6.5% Apricot and Grapefruit rye. Inspired by their version of the classic Old Fashioned cocktail. Saturday sees the battle of the IPA’s III. This time its Kohatu vs Pioneer. You decide the winner. 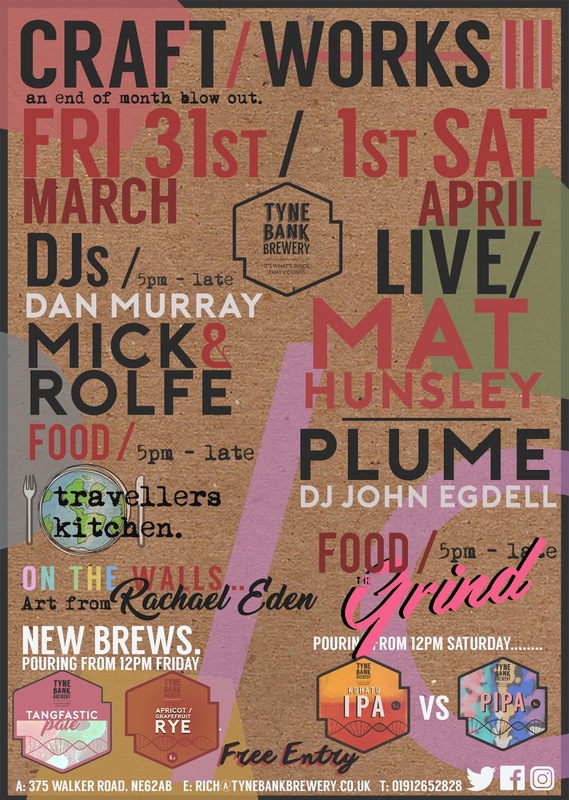 DJ sets on Friday night come from Dan Murray & Mick Rolfe, taking you throught to the early hours! We'll also have figurative paintings/drawings on the walls by artist Rachael Eden. Live Music on Saturday night comes from Mat Hunsley, with his unique brand of narrative driven folk. Alongside him we are happy to have Plume back. They played on our opening night and we’re super excited to hear their ethereal, experimental jazz again.